HURRY TO FINNIN FORD. Offer Expires November 30, 2018. Disclaimer: * Must finance and quality for Ford Credit Rebate. 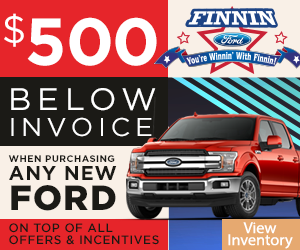 * * $500 under invoice on current in stock new 2018 models. All prior sales excluded. Must take delivery by November 30, 2018.